You probably saw your first angelfish in a friend's aquarium or perhaps your own. The colors, shape, and graceful presence make it one of the favored tropical fish. Now, you are ready to make the plunge into deeper waters and looking forward to getting up close and personal with these beautiful, graceful exotic fish. The three most easily recognizable angelfish are the Gray Angelfish, French Angelfish, and the Queen Angelfish. These three are among the largest of the species and swim in warmer waters in the West Atlantic Ocean. One way to make your snorkeling or diving experience more enjoyable and memorable is to learn the characteristics of your favorite fish. Gray Angelfish: These fish are primarily gray, but covered with dusky spots. Their most visible spot of color is their yellow pectoral fin. They also sport a bright white snout. Full-grown adults grow up to 24 inches long and five pounds. French Angelfish: The bright yellow rim around all of its scales and the yellow rims around the eyes make the French Angelfish easy to identify. The fins are all black, with the exception of a yellow base on the pectoral fin. Long streamers trail from their dorsal fin and they can grow up to a range of 18-24 inches. 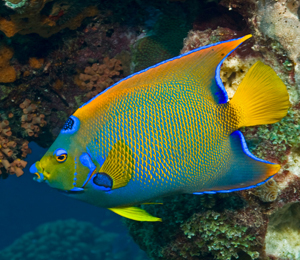 Queen Angelfish: Aptly named, this angelfish is the prom queen of this trio. The combination of electric blue and vibrant yellow bodies along with elongated dorsal fins creates a stunning vision. Another distinct characteristic of this royal fish is the speckled and blue-ringed black spot on their forehead. Now that you are prepared to face one of your favorite fish in the wild, your next decision is where to take the plunge. You may want to dive Key West, where crystal, clear waters with median temperatures add to the underwater experience.